Today's VIS image is located along the margin of Ultima Lingula, where the polar cap meets the surrounding plains. 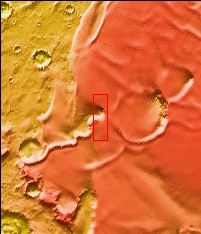 The feature in the center of the image is a chasma where the ice has eroded down the the surface of the plains. The extensive layering of the polar ice was created by seasonal deposits of ice and dust.